Yesterday, we talked about all of the noise in the recent state-by-state results. With perhaps a couple of dozen polls coming out each day, from firms with radically different views about how to model turnout, and in regions of the country that are each reacting slightly differently to the post-convention environment, there are bound to be results that cause some cognitive dissonance. The big takeaway, naturally, is not to get too hyped up about any one individual result. 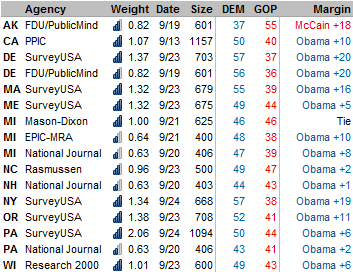 Rasmussen has Barack Obama 2 points ahead in North Carolina? Good for him. Gallup had John McCain draw back into a tie in their daily tracker? Good for him. The polls can actually be more difficult to read when a race is (relatively) stable than when it's shifting toward one or another candidate. But you throw everything into a blender, and the race is pretty much at a point of equilibrium -- which, of course, will probably be ruined tomorrow if and when we have the opening debate in Mississippi. The best results for John McCain and Barack Obama are the polls in Maine and North Carolina, respectively. The North Carolina number really shouldn't be all that shocking. The state had been stuck on about a 3-point McCain lead for months, but with the Obama campaign having worked the state harder than McCain, it's not surprising that we finally had a poll that showed him with a lead there. 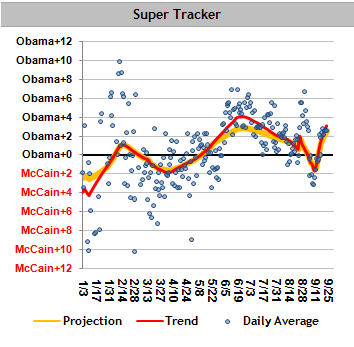 Still, the model is hedging on considering the state a true toss-up because of that McCain +20 poll from SurveyUSA, and the McCain +17 from Research 2000, each of which came out a couple of weeks ago. If SurveyUSA and R2K resurvey North Carolina and give Obama a better number, he will gain ground fairly quickly. Until then, caution is warranted. One other thing to keep in mind -- North Carolina is a big retail banking center, so the candidates' positions to the bailout may get extra scrutiny here. SurveyUSA gives Barack Obama a relatively narrow 5-point lead in Maine, making this the second consecutive poll -- along with Rasmussen -- to show the state in the mid-single digits. Usually this is the point of the campaign where the candidates start to consolidate their number of states, but there's an argument that McCain ought to send Sarah Palin out there, particularly to ME-2, where her backwoodsy charm could play well (Maine awards one electoral vote to the winner of each district. With that said, SurveyUSA revealed nearly identical results between the first and second districts, and they have usually voted very similarly in the past. Like many campaign decisions, this one will probably be dictated by McCain's internal polling. Finally, Pennsylvania and Michigan appear to be drifting past one another like slowly-moving tectonic plates. While Pennsylvania had appeared to be a stronger state for Obama for most of the cycle, we now have it projecting as an Obama +4.1, to Michigan's Obama +5.3. If an election were held today, Obama would almost certainly win both -- but if things tighten again, Pennsylvania rather than Michigan may be the focal point.